The role of motion pictures in the popularity of rock music became increasingly significant in the latter twentieth century. Rock music and its interaction with film is the subject of this significant book that re-examines and extends Serge Denisoff's pioneering observations of this relationship.Prior to Saturday Night Fever rock music had a limited role in the motion picture business. That movie's success, and the success of its soundtrack, began to change the silver screen. In 1983, with Flashdance, the situation drastically evolved and by 1984, ten soundtracks, many in the pop/rock genre, were certified platinum. Choosing which rock scores to discuss in this book was a challenging task. The authors made selections from seminal films such as The Graduate, Easy Rider, American Grafitti, Saturday Night Fever, Help!, and Dirty Dancing. 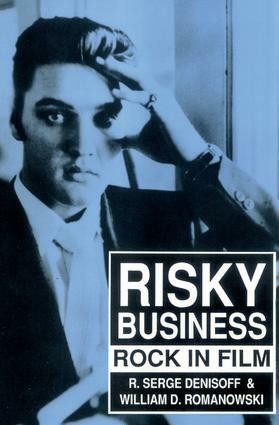 However, many productions of the period are significant not because of their success, but because of their box office and record store failures.Risky Business chronicles the interaction of two major mediums of mass culture in the latter twentieth century. This book is essential for those interested in communications, popular culture, and social change. Movie + Soundtrack + Video = $$$ !! !